In this installation I want to jump ahead in Greenhalgh’s paper to address her last cause of the EBM crisis: “Poor fit for multimorbidity“. Not to worry, I will come back in a future post to cover the remaining “problems” of EBM. I concur with Greenhalgh that individual studies have limited applicability by themselves in a vacuum to patients with multimorbidity. Guidelines don’t help a they also tend to be single disease focused and developed by single disease -ologists. So is EBM at fault here again? Of course not. EBM skills to the rescue. 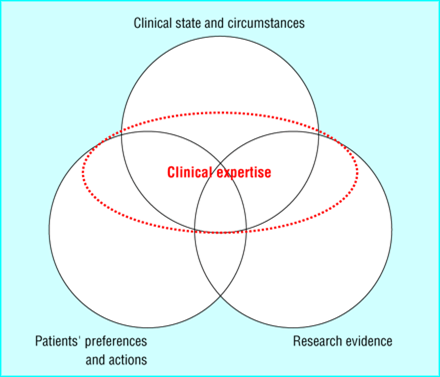 The current model of EBM demonstrated below contains 2 important elements: clinical state and circumstances and clinical experience. Clinical state and circumstances largely refers to the patient’s comorbidities, various other treatments they are receiving, and the clinical setting in which the patient is being seen. Thus, the EBM paradigm is specifically designed to deal with multimorbidity. Clinical expertise is used to discern what impact other comorbidities have on the current clinical question under consideration. and, along with the clinical state/circumstance, helps us decide how to apply a narrowly focused study or guideline in a multimorbid patient. Is this ideal? No. It would be nice if we had studies that included patients with multiple common diseases but we have to treat patients with the best available evidence that we have. Greenhalgh and colleagues report that the “second aspect of evidence based medicine’s crisis… is the sheer volume of evidence available”. EBM is not the purveyor of what is studied and published. EBM is a set of skills to effectively locate, evaluate, and apply the best available evidence. For much of what we do there is actually a paucity of research data answering clinically relevant questions (despite there being alot of studies- which gets back to her first complaint about distortion of the evidence brand. See part 1 of this series). I teach my students and housestaff to follow the Haynes’ 6S hierarchy when trying to answer clinical questions. As much of the hierarchy is preappraised literature someone else has had to deal with the “sheer volume of evidence”. Many clinical questions can be answered at the top of the pyramid. I concur with Greenhalgh that guidelines are out of control. I have written on this previously. We don’t need multiple guidelines on the same topic, often with conflicting recommendations. I believe that we would be better off with central control of guideline development under the auspices of an agency like AHRQ or the Institute of Medicine. It would be much easier to produce trustworthy guidelines and guidelines on topics for which we truly need guidance. (Really American Academy of Otolaryngology….do we need a guideline on ear wax removal?) It can be done. AHCPR previously made great guidelines on important topics. Unfortunately we will probably never go back to the good ole days. Guidelines are big business now, with specialty societies staking out their territory and government and companies bastardizing them into myriad performance measures. 2 papers got published this week to further validate the pooled risk equations developed for the ACC/AHA Cholesterol Guidelines. Muntner and colleagues used the REGARDS participants to assess the calibration and discrimination of the pooled risk equations. This study had potential as it oversampled patients from the stroke belt. This is important because the Pooled Risk Equations were developed to overcome the limitations of the Framingham tool (mainly its lack of minorities). I have a real problem with this study because the pooled risk equations estimate 10 yr risk of CHD and stroke and this study only has 5 yrs of follow-up for the REGARDS participants. I don’t think their estimates of calibration and discrimination are valid. 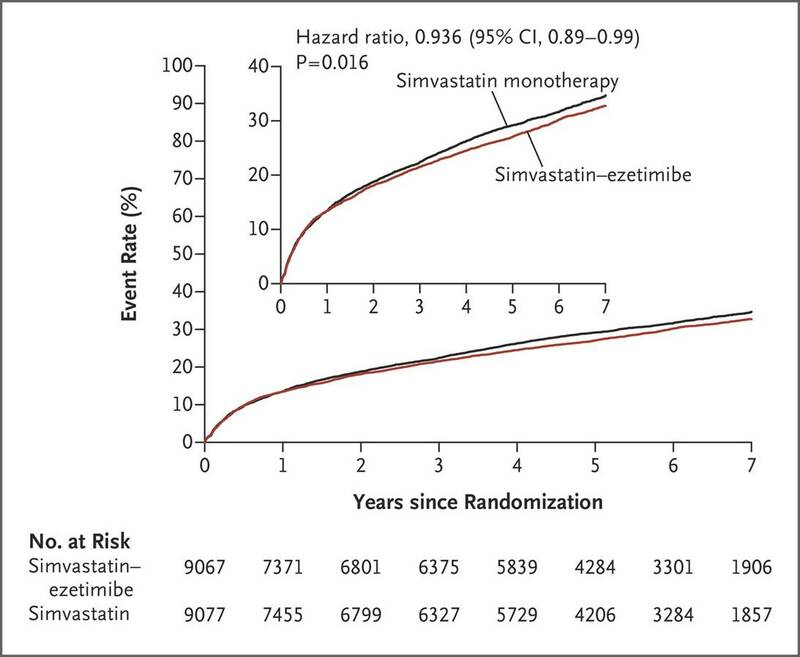 Risk of CHD and stroke should increase over time so event rates could change with 5 more years of follow-up. The important thing this paper adds is the reminder that observational studies often lack active surveillance. Most observational studies rely on self report of outcomes and obviously silent events would be missed by the patient as would events for which the patient didn’t seek evaluation. Muntner and colleagues also used Medicare claims data to identify events not detected through routine cohort follow-up and found 24% more events. This is a useful lesson from this study. In a more useful study Kavousi and colleagues compared 3 risk prediction tools (pooled risk equations, Framingham, and SCORE) using the Rotterdam Study, a prospective population-based cohort of persons aged 55 yrs and older. This cohort does have 10 yrs of follow-up. This figure shows that at each level of risk the pooled risk equations overestimated risk, though less so in women. This figure shows the proportion of patients for whom treatment is recommended (red bars), treatment should be considered (yellow bars), and no treatment is recommended (green bars). As you can see the new risk tool leads to the large majority of men “needing treatment” compared to previous guidelines (ATP III) and the current European guidelines (ESC). Finally, this figure shows the calibration curves and the calibration was not good. The blue dots should lie right upon the red line for good calibration. Furthermore, the c-statistic is 0.67 (a measure of discrimination which means the tool can differentiate diseased from nondiseased patients. A c-statitic above 0.7 is considered moderate to good. The closer to 1 the better). Why might the pooled risk equations overestimate risk? Maybe they don’t if you believe the Muntner study. It could just be a problem with the lack of active surveillance in the cohort studies used to validate the tool. Or they really do overestimate risk because they aren’t accurate or maybe more contemporary patients receive better therapies that improve overall health or maybe the baseline risk characteristics of the validation cohorts just differ too much from the development cohorts. I am still not sold on the new pooled risk equations but they might not be much better than what we have been using based on the Kavousi study (Framinham also overpredicted risk and had poor calibration). I think we need more study and tweaking of the tool or we use the tool as is and focus more on cardiovascular risk reduction (with exercise, diet, tobacco cessation, diabetes and HTN control) and don’t focus so much on starting a statin right away.